Steenwijk is located in the head of Overijssel. On the wet westside this picturesque town borders on the water region of Giethoorn and the Weerribben. On the dry eastside you will find the nature areas De Woldberg and De Eese. In this area of 1500 ha. you will see forests, heaths, fields, charming farmhouses and a real small castle. You will find two cottages in this fabulous region: De Arendshorst and De Valkenhorst. De Valkenhorst is a very comfortable bungalow with 5 bedrooms that sleep 3 persons each. There is a large bathroom with bath, shower, wash basin and toilet and a second bathroom with shower and wash basin. 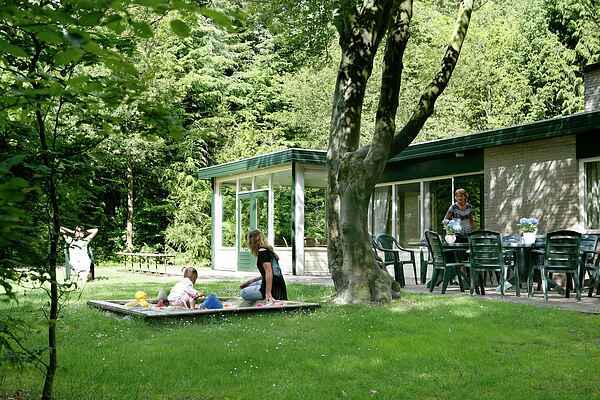 De Valkenhorst is spacious and offers a large hall and a spacious living room. There is also a 25m veranda. This cottage also offers a sunny and sheltered terrace. This house is ideal for family celebrations. This house is often rented in combination with the six-person bungalow located between "De Arendshorst" and "De Valkenhorst".